Farm Mom's Musings: One Down! With some fast and furious knitting, I have finished my first project of the year. Just as the last of 2016 was a hat for my littlest granddaughter, my first FO or Finished Object is another hat. But this time it is for my oldest granddaughter. 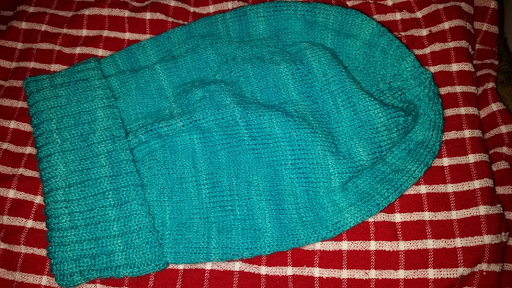 I know it looks long but the Turquoise Sockhead Hat is a slouchy hat and the length makes it slouchy. It even fits nicely on my big head, with room for my hair clip. 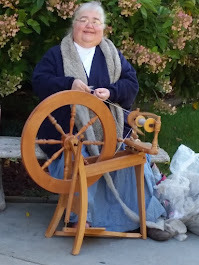 Once I catch up on all of my knitting goals and dare start something new, I just may make one for myself. And there I go, already wanting to cast on a new project. But I will carry on with my previously stated goal and continue on to the Graceful Harvest cardigan, again for my favorite teen. I will probably want to make one of those for me too, when I get done. ;) Always wanting what you made the favorite teenager. I think the teenager will be thrilled with that hat!